The Elephant Coast, situated in the north eastern part of KwaZulu Natal, borders Swaziland in the north west and Mozambique in the north and is also known as Zululand and Maputaland. The area offers an unforgettable opportunity to retrace the paths of past traders, explorers, and tribesmen, to view traditional homesteads amongst tribal communities and to revel in the areas unspoilt beauty. Ghost Mountain Inn genuinely provides the perfect base to explore all that this amazing area has to offer. Take a trip south to the iSimangoliso Wetland Park, a World Heritage site and Hluhluwe Imfolozi Game Reserve for an unforgettable journey into nature. Adventure north to Ndumu Game Reserve or Tembe Elephant Park, home to the last wild elephants of southern Africa, or view traditional fish kraals at Kosi Bay. Visit Kosi Bay or Sodwana Bay, where endless golden sand hugs the coastline of Maputaland and some of the best snorkelling and scuba diving reefs are to be found..
Kosi Bay, near the Mozambique border in the north, has a system of four lakes that run parallel to the sea for 18km. For those with a 4×4 visit the Kosi river mouth for a beach experience bar none. Rated as one of the ten best diving sites in the world, Sodwana offers something for the more adventuresome. Activities such as diving, snorkelling, quad biking and horse riding can be arranged. In season, turtle watching at night is also available. Sodwana is about an hour and a half’s drive from Mkuze if you need to drive on tar or about an hour on a much shorter dirt road. Before being proclaimed as a Park in 1981, elephants roamed freely in this area. Tembe offers a Big 5 experience and is accessible by tar road but you need a 4×4 to drive in the park or one can arrange for game drives. The Ndumu Game Reserve is one of the most interesting and most attractive in South Africa. It lies on the flood plain of the Pongola River, an expanse of wetland with tropical and subtropical habitats. Kosi Bay, near the Mozambique border in the north, has a system of four lakes that run parallel to the sea for 18km. 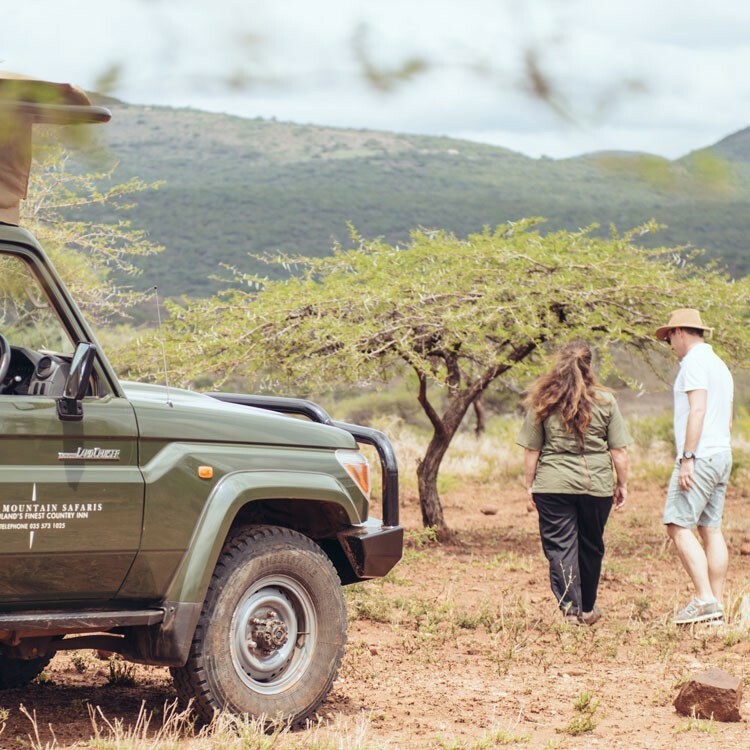  For those with a 4×4 visit the iSimangaliso Wetland Park which was listed for its outstanding natural values as a UNESCO World Heritage Site in December 1999. These natural values are exceptional biodiversity, ecological processes and superlative scenic beauty. The town of St. Lucia is a beautiful South African village. Enjoy a cruise on St Lucia estuary. Visit the Eastern shores set between the estuary and the ocean. Whale and turtle tours are available in season. Deep sea fishing, snorkeling and canoeing can be arranged. Border cave has been occupied by humans, virtually continuously, for about 190 000 years and is one of only a few archaeological sites in the world with a complete stratigraphic record. More than a million artefacts have been excavated from the site including the Lebombo Bone, dated to 35,000 BC making it the oldest known artefact linked to the basic mathematical activity of counting. Muzi Pan is a 15km stretch of water within the iSimangaliso Wetland Park forming a natural boundary between the park and the KwaJobe tribal land. The southern end of the pan borders Mkuze Game Reserve. Both shores of the pan boast a wide variety of bird species (The possibility to add a Pel’s Fishing Owl to your list). The pan is a base for a wide variety of game, as well as the numerous resident hippo, and offers a magnificent nature experience either on a canoe or guided walk. The oldest game park in Africa (along with nearby St Lucia), this reserve was proclaimed to prevent the white rhino from becoming extinct. Eighty species of mammal (including the big five) and in excess of 300 species of birds are supported in this 96,000HA reserve. Apart from the Hluhluwe Game Reserve, pay a visit to Illala Weavers’ zulu craft museum. There is also an African cat rescue centre near the town as well as a Zulu cultural history village. .
Lake Jozini lies in a dramatic setting at the foot of the Lebombo Mountains and is one of South Africa’s largest dams. There are several exquisite gorges abound with cycads as well a wide variety of birds. On the western side of the dam one might have the privilege of seeing the likes of elephant, rhino, hippo and crocodile. . The reserve harbours an astonishing diversity of habitats ranging from the eastern slopes of the Lebombo Mountains to stretches of rolling acacia savannah, swamps, woodlands and riverine forest. Wildlife includes black and white rhino, elephant, giraffe, leopard, cheetah, buffalo and a multitude of plains game. Lion were reintroduced to the park in 2013 making it a Big 5 reserve. The birding is exceptional – 420 species recorded. uMkhuze offers a Fig Forest Walk (5-6hrs) which is highly recommended. .